Now don't get me wrong, I love Twitter as a platform. It's the main promotional device for my blog, and it connects me with a ton of talented bloggers and interesting companies. But, as with all things in life, there are some people on Twitter who just drive me nuts. I've narrowed them down into a list of seven. Prepare yourself for sass. This girl seems to think that the best way to gain followers on Twitter is to follow a shitload of people, wait for them to follow back, and then unfollow almost everyone once she hits 13k in order to look like a total boss. Who does she think she's fooling? 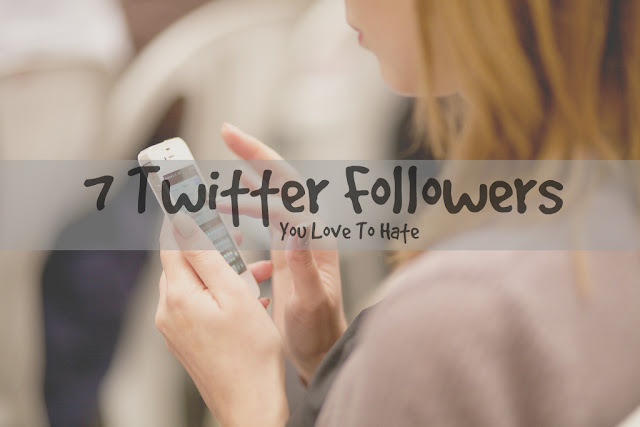 Most people have a little app called Crowdfire these days, which allows you to see exactly what those follow-to-unfollow people are up to. Sorry Ulrica, take your tactics elsewhere! Even if you send out a tweet saying that you've just seen a turd floating in the swimming pool, or that your cat has just puked up a hairball in your bed, this person will like it. They'll like tweets from your conversations with other Twitter users that they aren't even mentioned in. They'll like tweets from several days and weeks and months ago. Why? How? What's the point?! No one knows. Also known as Spammy Susan or Julie Junk. This person uses Twitter for the sole purpose of driving traffic to their blog. They never make an effort to engage with their followers, they simply pepper them with links. This might be super effective at generating traffic, but it makes you seem kinda soulless. Why not just engage with me? Please? There's always one person on your feed that's always itching for a fight. There is NOTHING that'll keep this girl out of an argument. Even if it's nothing to do with them, or if they don't really have a strong opinion on a subject, they'll form one in 0.2 seconds and jump in if they sense a scrap of drama. Grab your popcorn whenever they're online, you're in for a bumpy ride! The giveaway fiend. Their timeline is full of retweets from every competition and giveaway under the sun. They might win that free sample of Toilet Duck, sure, but they irritate pretty much everyone that follows them in the process. If they follow you when you're running a prize draw, don't expect them to stick around once it's over. Whether it's Juice Plus or Younique, there's always someone on your timeline trying to flog their products. Receiving DMs from these people is possibly the most irritating thing on earth. I would love to reply to each one: "No, I do not want to find out about the *amazing* health benefits of your overpriced powdered crap that is peddled hella unethically by people who often have no nutritional qualifications." And breathe. Can you tell I hate the stuff? Now I don't know about you, but I don't advertise the fact that I enjoy a thick, juicy steak, and the occasional KFC in my Twitter bio. Certain vegan guys and gals on the other hand just LOVE to shout about their eating habits. You're vegan? Great! I respect your decision. Just don't ram it down my throat, I prefer putting lamb chops there, thank you. Have you experienced any of these people on Twitter? Let me know in the comments! Disclaimer: No real names have been used in this post. I made the names up for fun!